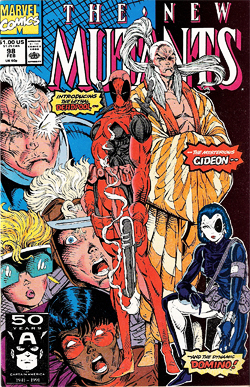 New Mutants 98, cover dated February 1991.Nope, we’re dead(pool) serious: this is an ultra-niche one-page comic book website, to challenge the “rarity” of New Mutants 98, and actually attempt to devalue it on the back issue market. It came from the Copper Age! We’re gonna be referring to the “Copper Age of Comics” a lot here, and not just because New Mutants 98 was published during that era…there were also some back issue market trends during that period we’d like to make comparisons to. New Mutants 87, Cable's first full appearance.Okay, at the tail end of 1989, Rob Liefeld starts his run on New Mutants with issue 86, instantly reviving sales of the book. But it’s the next issue (that’d be issue 87, check our math on that), that Cable was introduced, prominently on the cover, with cover inks by Todd McFarlane no less. 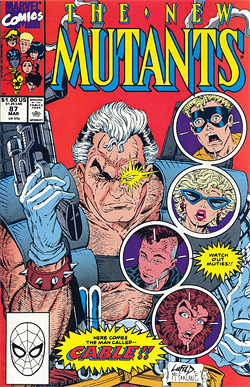 It was quickly apparent to collectors, dealers, and speculators that Cable was being positioned as a major player in the Marvel Universe – especially the mutant books – and that New Mutants 87 was (or would be) an important first appearance back issue; it quickly hit the $10 to $25 range during that time, and after years of plateauing at that value, now has crept up to the $50 to $100 range. We think it’s halfway safe to assume that during Rob Liefeld’s fifteen issue run on New Mutants, that each issue saw an increased print run over the issue previous. Liefeld was undoubtedly one of the hottest artists in the industry and still on the rise, and the collector’s market was simultaneously hyped up on “McFarlane Mania,” with Todd’s popularity at a fever pitch in 1990 / 1991. Everyone knew how those early (and even later) McFarlane Amazing Spider-Man issues shot up in value, so no one wanted to miss the boat on Liefeld’s New Mutants. We should think Marvel was rolling a ton of copies off the presses (in greater and greater print runs) for all those collectors and speculators jumping on New Mutants with each subsequent issue. 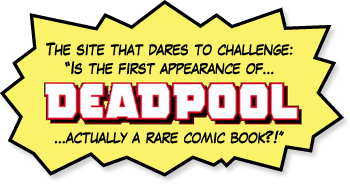 However, by the time New Mutants 98 came around, the introduction of, “Deadpool! Domino! Gideon!,” didn’t seem to have the same cache as that Cable introduction in issue 87. New characters were being introduced left-and-right in the title during Rob’s run, so there was sort of a “new character dilution” going on. New Mutants 98 had a cool cover for sure, it’s simply that it was just another issue during an overall hot run; issue 87 was still the one to get…at the time. A $200 book during the mid to late '80s.Nope we’re not talking about the value inflation of New Mutants 98 just yet. 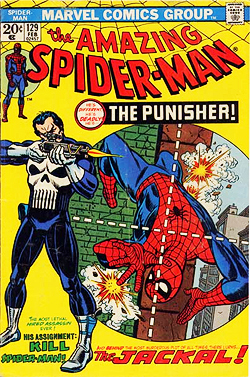 We’re still looking back at the Copper Age, and two key Marvel first appearance books: Hulk 181 (the first appearance of Wolverine), and Amazing Spider-Man 129 (the first appearance of the Punisher). Sure, those two issues were published in the mid-‘70s – during the “Bronze Age” – but it was really during the ‘80s, and especially during the Copper Age that they really started to appreciate in value. Wolverine and the Punisher were the go-to Marvel antiheroes that continued on their popularity tear, and they weren’t just yet totally overexposed across the Marvel line. $200 was pretty much the going price during the Copper Age for copies of Hulk 181 and Amazing Spider-Man 129 in Near Mint condition. Of course, this was all pre-CGC. Still in the Copper Age. For those of you collecting during the era, hopefully you’ll also clearly remember the “Black and White Boom” (and bust) that happened about 1985 to 1987. There were actually a lot of great independent black and white titles, but unfortunately then also a deluge of garbage ones that really damaged the overall perception of independent comic book quality. Anyway, there were some pretty good (some very good) black and whites, where their first issues peaked in the $25 to $50 range in 1986. Including, but not limited to, and in no particular order: Elementals, Grips, The Adventurers, Samurai, Fish Police, and Trollords. Those were really hot back issues, during a moment in time when many collectors were after them, in the mid-‘80s. You can now find many of them in dollar boxes. Yes, we’re serious. Yes, the first issues. Yes, they devalued that much. 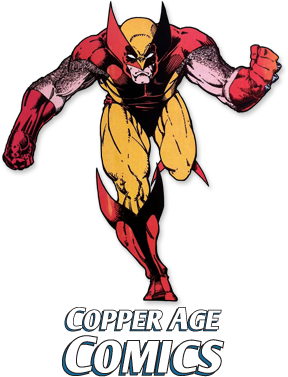 Okay, finally flash forward to about 2010, that’d be twenty to twenty-five years post-Copper Age. Actually before that, sure, we knew all about the comic book industry crash of the mid-‘90s, the “Marvelcution” layoffs during that time, and how the back issue market really took a nosedive. Comic stores, dealers, and speculators were dumping comics. Quarter and dollar boxes were being stuffed with unsold inventories that were accumulated during the ‘80s and early ‘90s, including most of Liefeld’s run on New Mutants. Yes, including issue 98. During its peak in say 1991 or 1992, each issue of Rob’s run went for maybe $3 to $5 tops (with the exception of the pricier 87), as there were really a lot of ‘em out there. As collectors left the market, those issues entered the dollar bins. But then, after some slow, painful years, the comic book industry recovered a bit. Not close to anything seen in the early ‘90s, but still. 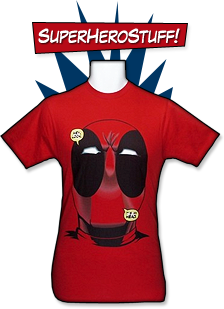 And Deadpool slowly evolved into (mutated into?) 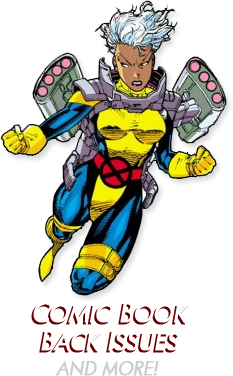 one of most popular characters in the Marvel Universe. Over the course of what? Ten to twenty years? Is New Mutants 98 on the same level? !Okay, after the long-winded set-up you’ve been reading above, we’ve finally landed on our argument. Actually, a little more set-up: we hadn’t paid much attention to the back issue market for quite a while, say from 1995 to 2010. When we did start browsing eBay around 2010 to see what’s what, we were absolutely astounded to see how many of the hot books from the ‘80s had greatly devalued, and even more shocked that conversely, New Mutants 98 had emerged as THE mainstream superhero Copper Age key issue, if your criteria is what it currently fetches on eBay. $75. $150. $300. $1000 plus for a high grade CGC slabbed copy. Well, not really. We’re not denying Deadpool’s popularity as a character or that there are a certain number of fans who want to own his first appearance. We’re challenging that there isn’t more than enough ample supply (in high grade!) to meet the demand? 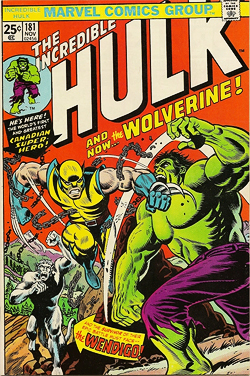 The key difference between New Mutants 98 and say Hulk 181, was that Hulk 181 was published during a pre-speculation time, when comics were still of the, “kids stuff, disposable entertainment” variety. By the ‘80s, the importance of preserving comics in pristine condition was well known in the collecting world, and bags-and-boards were the way of the walk. With everyone speculating on the hot artists of the late ‘80s and early ‘90s – with print runs well into the hundreds of thousands – it’s probable that many, many copies of New Mutants 98 went straight into a bag-and-board, right out of the distributor box. Realistically, there are probably enough nice copies of New Mutants 98 on the planet for every man, woman, and child interested in owning a copy. With plenty left over. There’s simply not as many collectors in the market as there were copies published. That’d constitute a “surplus.” If all the copies were out on the market, that is. 1) There are dealers with many, many copies of New Mutants 98 (possibly long boxes full of them), and they are slowly making them available, cautious as not to sell too many of them before the demand (and therefore, price) peaks out. This is causing an “artificial shortage,” creating the perception that there are significantly less copies out there, than there actually are. Dealers are holding back copies, but with that being said, there always seems to be a steady stream of them on eBay. It’s just they’re pricey. Currently. 2) It’s possible that there are indeed some copies in “forgotten inventories.” That is, dealers that were active in the ‘80s and early ‘90s, who dropped out of the back issue retailing world, because they were stuck with a ton of worthless back issues after the market crashed in the mid-‘90s. Having not kept up with the market and how Deadpool’s first appearance has become significant in the collecting world over time, they don’t even realize what they have sitting there. 3) Even more possible are that a ton of collector-speculator copies from the era are sitting under beds in their parents’ houses, and those collector-speculators have also long dropped out of the back issue world. During the insanity of the late ‘80s / early ‘90s comic book boom, just about everyone was buying multiple copies of something, especially the hot artist books. Including us. Yep, we probably had 5 to 10 copies of New Mutants 98 during that time, and then just dumped them on the market in the mid-‘90s when we sold the duplicates in our collection…but those copies had to go somewhere. 4) Unless our copies did at some point go in the trash. Not that probable though, even when New Mutants 98 could be found in dollar boxes. Though, because the issue was “worthless” for a stretch of years, it is possible a significant number of copies left their bags-and-boards, and got dinged up, shuffling around loose in dollar boxes. Diminishing the number of high grade copies out there. And by “diminish,” we mean there’s still a hundred thousand copies out there in pristine condition, at least. 5) Some copies are in the hands of collectors who are legitimately fans of Deadpool, first appearances, Marvel, or whatever, and have a copy of New Mutants 98 in their personal collection. Will it cool off? If so, when? 1) A key factor in igniting New Mutants 98’s current heat, was the announced plans for a Ryan Reynolds’ Deadpool movie, spinning out of 2009’s X-Men Origins: Wolverine. For a stretch, the movie was in development hell, and we theorized, “Well, what if the movie never actually happens?" Our thought was that the dealers and speculators who’ve been counting on the movie to show up one day, well, that’s what they’d been holding back copies for; that as the movie approaches, demand for New Mutants 98 would go nova. That would be the optimal prime time to throw your 100 copies on eBay. ...but as with many of those independent black and white books that peaked in value around 1986, there comes a point where collectors step back and ask themselves, “WHY do I actually want this comic book, and will pay this inflated price for it? Do I truly want it? Or is it really because other collectors want it, and I think I want it because of that?” When enough collectors ask themselves that, the market starts to sober up. Those who have been sitting on copies start to get concerned, which can turn in to panic. Copies start to dump on the market. And the New Mutants 98 downward price spiral is on. 4) The website you’re reading right now does actually prompt manifest destiny, and succeeds in devaluing New Mutants 98! Yeah, but I still really, really, want a copy. • We encourage you to always first support your local comic shop, and see what they can do on pricing. Maybe they’ll really hook you up. • Support the dealers at a local comic convention! We’ve always loved the small shows. 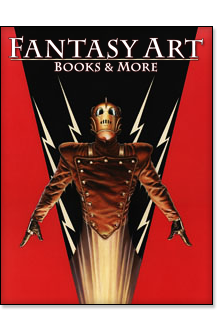 • Our online back issue retailer of choice is absolutely MyComicShop.com. Though we don’t think they’re necessarily your best bet for New Mutants 98, they have very reasonable pricing on most back issues from most eras, fantastic search functionality on their site, and great customer service. • Maybe you’ll get lucky on eBay, and not pay too much for a copy. • If you’re just interested in reading the issue, it’s included in the Deadpool Classic, Vol. 1 TPB, or as an inexpensive digital download. • “The Comic Book Apocalypse,” by Noun. He details how the first appearance of Turok in Magnus Robot Fighter 12 was heavily speculated on ahead of Turok’s regular series, and how all those copies got dumped on the market simultaneously, with no takers (when everyone owns it, there’s no one to sell it to). 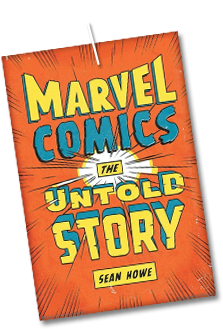 • For the behind-the-scenes history of and dirt on the world’s largest comic book publisher, we highly recommend Sean Howe’s Marvel Comics: The Untold Story. • CopperAgeComics.com details the era of comic books from 1984 through 1991, along with the blog VeryFineNearMint.com! • Are you just now getting into comic book collecting? 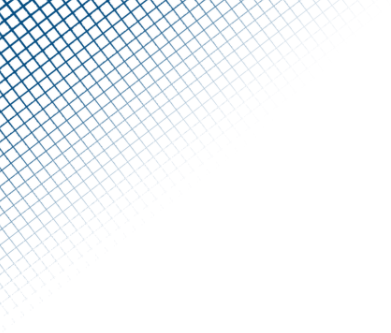 Visit Comic Book Back Issues and More, for recommendations of where to shop online!